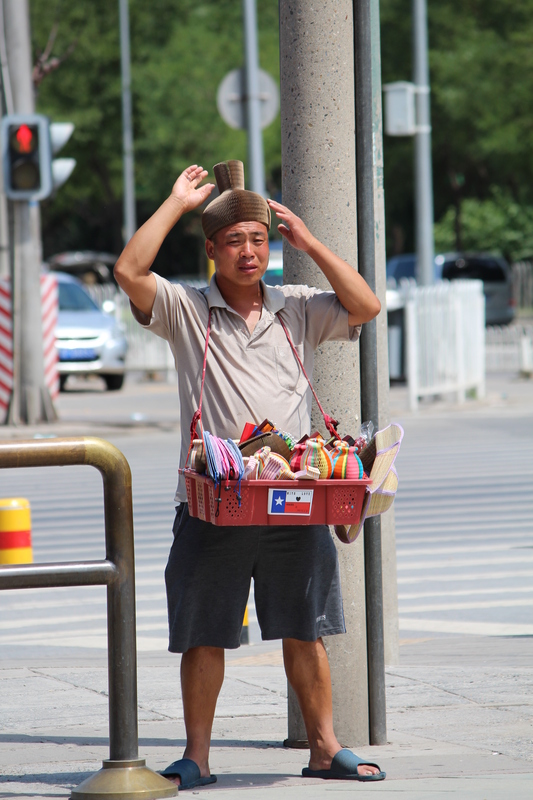 Those Beijing hat guys!! | Oh, the Places We See . . .
← Fly over the Forbidden City? Yes, you can! Who needs entertainment when you’ve got vendors and salespeople all around you? 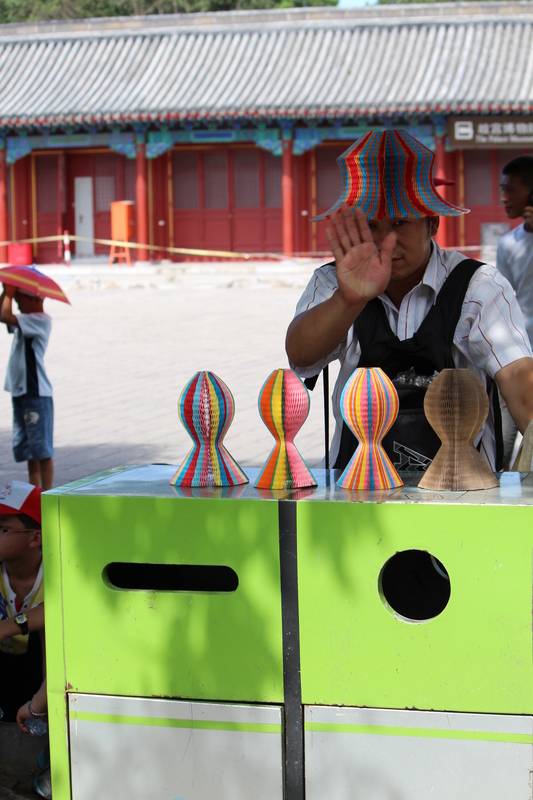 Beijing brought out dozens of hat guys selling collapsible paper hats. Some in rainbow colors. Some plain. But not all hat guys, you understand, are thrilled to be in pictures. The guy below, however, was. He could be on late-night TV — animated hijinks, inside/outside hat routine, connections with the crowd. First, with this ordinary hat shape — good enough to keep the sun at bay. Then with one quick flip . . .
. . . a whole new version! Tower look maybe? We clapped and hollered and shouted, Again! He smiled. And fidgeted. And then one more! One dollah, one dollah. Hat. Five ways. One dollah! Five ways! Now, who do you think would ever buy one of these crazy hats? To read more of our encounters in China, go to the top of this page and click China in the green bar! Thanks for reading! 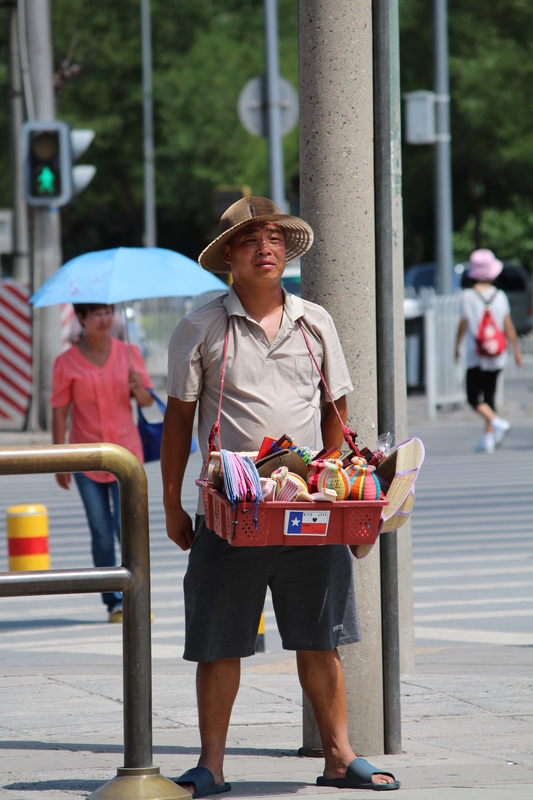 This entry was posted in Travel and tagged Beijing, China, hats, street vendors. Bookmark the permalink. 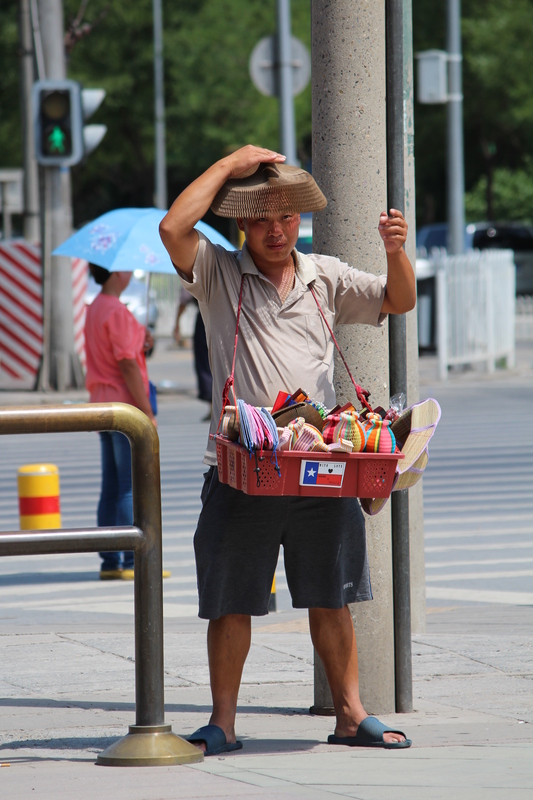 12 Responses to Those Beijing hat guys!! Thanks! It’s always fun to watch the vendors, and sometimes they’re as close as your face! We even had folks board the buses with us to sell everything from postcards to fans! It’s just part of travel, I suppose. Thanks for the tip on looking at a map. 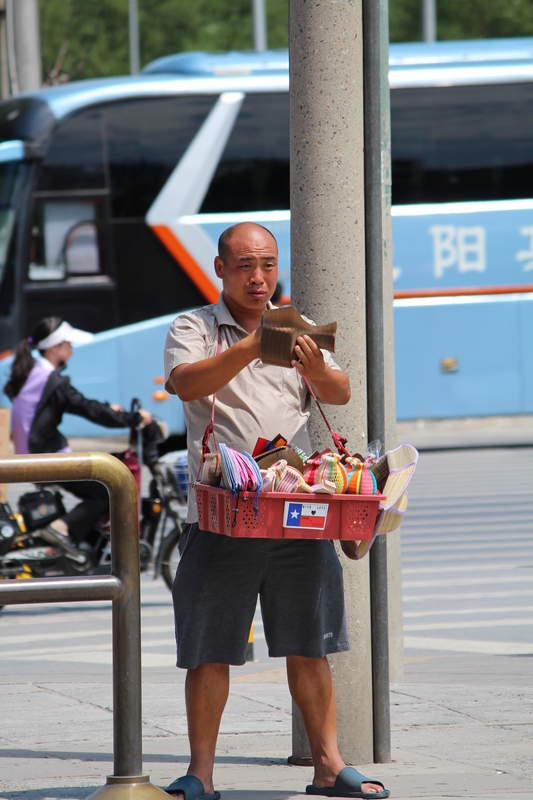 We did the same thing hunting for the insect market in Shanghai (another post comin’ up)! Hilarious! I love the way you’ve interspersed photos with narrative. Really fun to read. Thanks! I have fun with this blog — and really there’s no other reason to write. So thanks for joining me and commenting! Hmm interesting…I don’t recall seeing such fancy hat patterns when in Beijing, but that was 15 years ago. Keep up your posts about this interesting country, the info is invaluable! Thanks for joining me on this journey! China is fascinating! And the hat guys are in a long line with other souvenir vendors! These just seemed to have more showmanship than others did! LOL, Love these!!! Headed to China for a month starting Sunday. Your posts have definitely whet my appetite!! I hope to post a few more this week and next. I had to travel a lot with my job of training teachers the past two weeks. (Everyone wants professional development at the beginning of school!) Thanks for stopping by. Have a great trip to China. Would love to go for a month!!! The hats were neat, for sure, but we loved the guys who sold ’em even better. Great showmanship! Cool hats. I would like to have one. I probably should have included a picture of some of us on the bus wearing our hats! They look better on the guy selling them, but we had fun anyway!